Clubhouse wtih bar, lounge, restaurant and changing rooms. Pro shop with trolley hire. A tree-lined parkland course with well bunkered approaches to the greens. Played here with Paul Smith on the basis of potentially joining. First impressions were good, with a nice clubhouse and changing facilities, and a friendly face in the pro shop. The stand out holes are the 471 par 4, and the 234 par 3 off the whites! So as you can guess, this courses defence is it's length. We played it off the yellows, so not quite so intimidating, and I did manage to par the long par 3, though it was only playing a measly 189 yards. It had been very cold overnight, so many of the tee boxes and greens were partially frozen over. However, from what unfrozen sections we could see, both looked very good, and the fairways were also in good condition for the time of year. They have also recently upgraded a lot of the bunkers, and the couple I went in were well maintained. The remaining ones are due to be upgraded this year. As I have been advised the course drains very well, it seemed friendly when I returned for a second look, and it is very close to where I will be moving, I have bitten the bullet and decided to take advantage of a reduced joining fee deal that was running over December. I don't see my handicap plummeting, due to the length of the course, but I think the general condition will make it a pleasure to play on, and despite some road noise on a few holes, when the trees regain their leaves, it will be a nice course to walk around. It also has that old school traditional feel about it that I really like. played here with Dave Holmes who is thinking of joining the club. A flat course with no real defining holes that stand out but it has 2 long holes a par 4 of 470 yds off the whites and a par 3 of 240 yds. The greens were good even with the frost on them, the tee boxes were excellent and you could define the fairway and rough. It looks as if it would be a pretty course to play in the summer with all the trees out. It is a fair course long but if you are straight you can score well. A bit of road noise on a couple of holes. Nice club house with lots of tradition which is nice to see. Would I play here again yes I would. 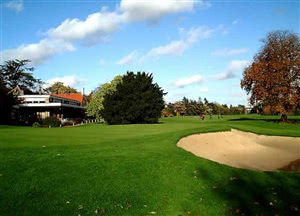 No water and little heavy rough but still a challenge to find many of the fairways on this attractive parkland course which is a bit hidden away behind iron gates in an otherwise unremarkable west London suburb. Very much geared for members with little signage and no strokesaver available, but you can see most of it and it's flat. Greens quite fast and subtle, hard to read the breaks. Very enjoyable course although was told by the member i played with that fairways have been in better condition, greens in good condtion, although a flat course there were plenty of enjoyable holes.